Before moving to Boulder I lived about 2 blocks off the beach south of LA and never even got in the water. We’d take walks in the morning before work and kids would always be out there for surf class for school. I always thought it looked like a lot of fun. We even had “surf day” at work every Summer and I still never took advantage of the lessons, even though I kinda wanted to. I grew up swimming, was a lifeguard at the local pool and coached swim team in the summers, but I’ve never been a fan of swimming in the ocean. I have a horribly overactive imagination and I think Jaws has had a lasting impact on me. I had a similar fear of camping after watching the Blair Witch Project. (Have not been camping since.) In the same way people continue to buy lottery tickets thinking they’re going to strike it rich, I have a similar irrational way of thinking that I will be the one who is some kind of magical shark bait. I hope I did not just jinx myself by writing that. Superstitions and irrational fears aside, I have 2 lessons scheduled on thurs & fri when I’ll be in Santa Monica. Until then I’ll be looking for inspiration from some of the great surfing films. I think this will be another week like when I learned to ski; I really have no idea whether I’ll end up liking it or not. Guess there’s just one way to find out. This is something I’ve always wanted to do, too! So brave 🙂 Good luck, can’t wait to hear about it. one of the best place for surfing in brazil is praia da pipa !! Is that picture for real and did you take it? I’ve never seen anything like that – it’s breathtaking. 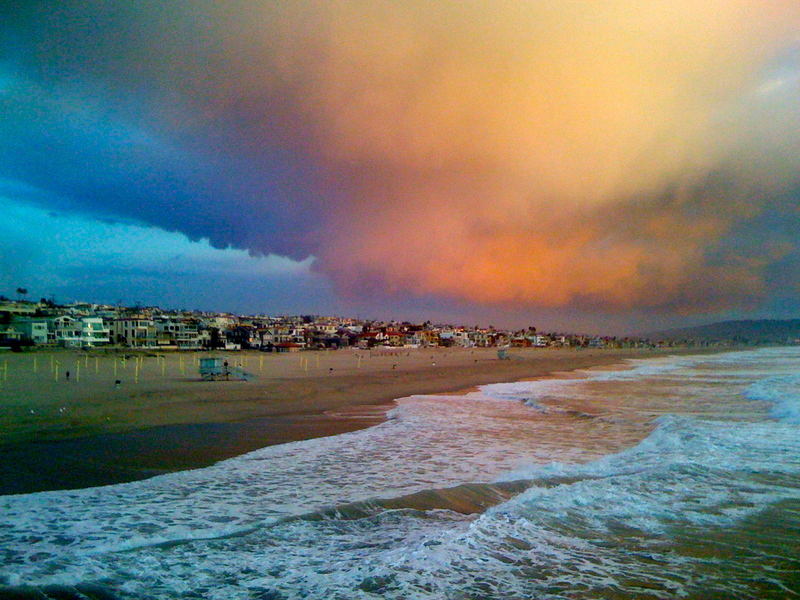 hey amy, that is a picture from the pier in manhattan beach where i used to live. that was an especially gorgeous sunset. looking forward to seeing what it’s like in the water tomorrow! Congratulations on learning to surf! I just made the same decision last summer after my 59th birthday. I went to Virginia Beach and bought a board. It was a blast 🙂 I’m heading to Florida in June for some surfing on my 60th birthday. I think you’ll love it after a little practice (and maybe some sore muscles), it’s all worth it! You are currently reading learning how to surf at 52 To Do.